I have often wondered if all mothers of school-aged children were asked to do an anonymous survey about whether they had ever dropped their child off at school in their pyjamas (assuming, of course, that they didn't have to get out of the car) what resulting percentage of secret pyjama wearers there would be. I must confess that I am guilty, not just of a once-off or a now-and-then offence, but of being a serial pyjama school run mum. And while I'm being honest, I might as well confess that I'm sometimes still in my PJs when I go to pick my son up from school in the afternoon too. As we leave the house in the mornings, my nine-year-old son and I have developed a bit of a routine: I grab the house keys, the car keys and the baby and go out the back door. As I do so, I stick the house key into the lock, leaving the door open. While I am putting the baby in her carseat and warming up the engine, Ben follows me out of the house, turns the key in the lock, gives me the keys and runs next door to get Han, the little girl who lives there, who we take to school. This usually works quite well because I can threatened Ben, who is the slowest breakfast eater in the history of the world, that if he doesn't hurry up I will drive Han to school and leave him at home. Fortunately for me, he likes school and this always speeds him up. He also doesn't want to miss out on seeing Han. Last Friday, however, our little routine did not go altogether smoothly. Neither Ben nor I are morning people and we were running even later than we usually do. The morning fog had also not yet lifted from our brains and, although we didn't realise it at the time, we were both operating in a state of muddle-headedness. I drove the kids to school in the usual way, decked out in pyjamas with a hoodie over the top. The little girl next door is used to seeing me dressed like this now. She either thinks it's completely normal or else she thinks I'm officially insane and is just too polite to tell me, because she's never mentioned it. After dropping them off, I drove home, parked the car, got the baby out of her carseat and patted my left pocket where I always put the housekeys. A feeling of dread washed over me. The pocket was empty. I checked the right pocket. I checked all through the car. I checked to see if they were still in the door. But alas, the door was locked and the keys were nowhere to be found. There was only one place they could be: in Ben's pocket. Now if I had been clad in socially acceptable attire, this would not have been much a problem. I would simply have driven up to Ben's school, knocked on the door of his classroom, explained the situation, got the keys, end of story. But this was not the case. Now don't get me wrong, I'm really not too concerned if people like the way I dress or not, but I had my son to think of here as well. It is doubtful if he would ever truly be able to forgive his mother for turning up to his school, where he is still very much the new kid on the block, in her flanellette pyjamas. Added to that, I was braless, make-upless and wearing a pair of big fluffy slippers (not that turning up to your kid's classroom in pyjamas is okay as long as you're wearing make-up, a bra and nice shoes, but I'm just trying to draw a picture of my physical state). I looked a little something like this, only hundreds and thousands of times worse, because this is my 4 pm face (I got Ben to snap a re-enactment shot when he came home from school) and at the time I had my 8:30am I-don't-do-mornings face on and believe me, you should be grateful that you're not looking at a photo of that. At this point a number of things went through my mind. Should I call the school and ask the secretary to ask Ben to meet me in the carpark? That might have worked, but my phone was inside the house. Should I drive to my sister's or my best friend's house, ask them to come back with me in the car and get them to knock on the door of Ben's classroom? That seemed like a plausible solution so I got back in the car and headed off and then realised that I had no petrol. Both of them live twenty minutes away and I would have been lucky if the car could have got half that distance. Even if I swallowed my pride and ventured into the petrol station in my nocturnal apparel, there was the small problem of money; my purse was locked inside the house too. Perhaps I was just going to have to risk it. I'd just get in there, get it done and get out as quickly as possible. If I put on my sunnies and just popped my head round the corner of the classroom door, keeping my body concealed, then surely there was a chance I might get away with it. I put my hand to the top of my head to reach for my sunglasses (which I never go driving without, even if it's overcast), but all I could feel was the top of my head. Of all days, of course this day would have to be the one where I forgot my sunglasses. I hunted round frantically in the car for my old ones which I knew had been floating around there recently, but all I found in the way of eyewear was a pair of 3D glasses. That's really all I needed to top off my outfit and give me a lifetime reputation as a flat out freak. At that point I also remembered that, being Friday morning, the whole school would also be having assembly. Parents are always invited to this of course, but this was far from a comforting thought. So besides gate-crashing the assembly and scarring my son for life, the only other alternative I could think of was waiting outside the house until school finished six and a half hours later. It was chilly, I had no clean nappies for the baby and the only thing to eat would have been the nasturtiums in the front garden. So desperate times led to desperate measures. The only thing left to do was to ask Han's mum, Thuy, for help. Thuy and I have met and greeted each other several times since we moved to the area a couple of months ago and she was very happy when I offered to drive her daughter to school, but up until that point, we had never been inside each other's homes and she had definitely never seen me so casually dressed. I knocked on the door and when she opened it, I blurted out "I need your help". I didn't even need to explain the whole story. As soon as I said "Ben's got my keys in his pocket", she nodded her head, got her coat and came outside. An amused little smile spread across her face. She doesn't have a car, so we both drove up to the school in mine. She got out and braved the crowds at the assemble to find Ben and bring the keys back to me where I was lying low in the car. When we got back to our houses, she invited me in for a coffee. I hung out in her loungeroom, without even bothering to go home and get changed, for another two hours. That little smile didn't leave her lips the entire time.I think we're going to become good friends. That afternoon when I asked Ben to take a photo of me for my blog (because, let's face it, I really have no life and don't have anything else to blog about), instead of apologising for pocketing my keys and allowing me to endure such emotional exhaustion, he said very matter-of-factly: "It's lucky you didn't come up to assembly this morning in your PJs, mum; your pyjama top doesn't even match the bottoms!" So in future I shall be far more careful. In future I shall ensure that I always go to bed in matching pyjama top and bottoms so the next time I get locked out of my house, at least I will look fashionably co-ordinated when my neighbour opens the door to me. 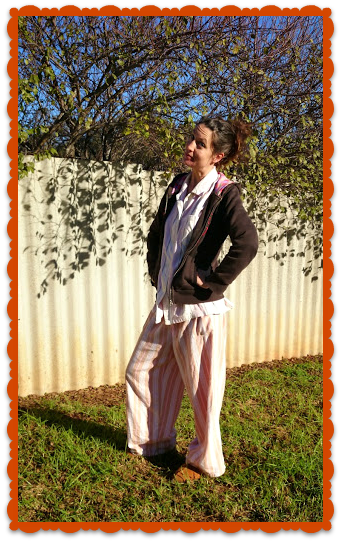 So tell me the truth ... do you do the school run in your PJs? Have you ever been caught out? Could you trust your neighbours to save you from public pyjama shame?